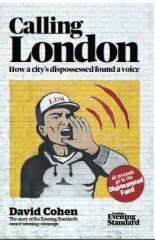 When investigative journalist David Cohen was asked by his editor Geordie Greig to write a series of pieces on poverty in London, neither knew how dark a shadow they would uncover. The response from readers was unprecedented, and those articles led to a campaign which in turn led to a £ 7 million Dispossessed Fund. All proceeds go to the Dispossessed Fund. David Cohen is the chief feature writer of the London Evening Standard and author of the paper’s award-winning Dispossessed campaign, which won Campaign of the Year and the Cudlipp Award at the 2010 British Press Awards. Cohen has been a journalist for 20 years, writing exclusively for the Evening Standard since 2002.